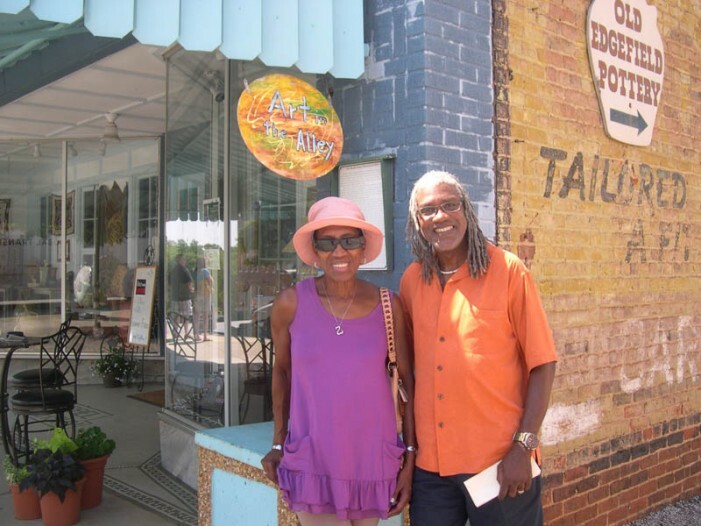 George Ligon and Cynthia Drakesford were among the visitors in Edgefield over the weekend. George is an artist (painting and music) who makes his living with his hobby, photography. They live in Greenwood. Cynthia is a retired educator/administrator. A number of visitors to our Town of Edgefield came by way of the “Heritage Trail–Pottery Tour and Sale” which started on Friday evening with a reception in Greenwood and concluded with tours of pottery studios from Greenwood to Edgefield on Sunday. Among those open Sunday: Greenwood, pARTners in CLAY; Ninety Six, Bell House Pottery; Bradley, TBob Pottery; Edgefield, Turtle Rock Pottery and PK Pottery; Johnston, Miller’s Pond Pottery. A drawing for two fine pots and doorprizes were among the special events of the weekend. Read our previous posting for in depth information on the Pottery Tour & Sale.